With the Owners Away, the Dogs Will Play! Are you searching for a professional and reliable pet sitter? You can stop sniffing around. 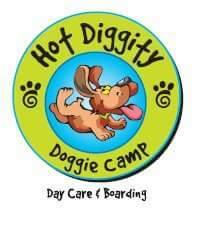 Bring your furry loved ones to Hot Diggity Doggie Camp. With a fenced-in yard, play equipment, pools and a sandbox, your dogs will have the best time at our facility. It's the perfect place to bring your pets and not have to worry about them while you're away. Learn More About Our Doggie Camp! Day camp - Pack your little ones a lunch and send them off to day camp. It'll be a fun-filled day of playing with other dogs. Training - In our puppy kindergarten program, we focus on socializing puppies with other dogs and teaching commands. Bathing Services- Bathing can be a hassle, so let us do the dirty work for you. We'll bathe your dogs, clean their ears and trim their nails. Boarding - We provide a safe and fun environment for your dogs while you're at work or on vacation. With over 10 years of experience, our staff has the skills necessary to provide the best services for your loveable pets. If you have to go somewhere, even if it's just for a day, you can bring your pets here, and we'll take good care of them. Call 205-345-4939 today to learn more about our boarding, training, day camp and bathing services or to schedule your doggy drop-off time. We look forward to taking care of your furry friends!